Frederick, MD is surrounded by scenic views, including mountains, wineries, orchards and happening communities. Frederick is an exciting town located just about an hour away from Baltimore, Gettysburg and Washington, D.C. You can enjoy your day shopping around town or hiking on the Appalachian Trail. Frederick, MD is committed to innovation and advocacy. The Frederick Chamber of Commerce is an association of businesses organized to ensure economic growth. The Chamber of Commerce is dedicated to protecting and improving Frederick’s business climate to keep the city thriving! Learn more about the Frederick Chamber of Commerce. 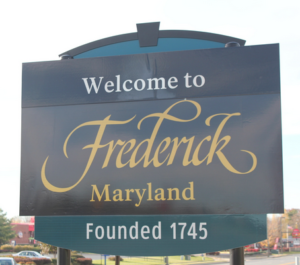 Frederick prides itself on economic growth and development. The 50-block downtown area offers plenty of thriving restaurants, storefronts and an exciting art and entertainment scene. For more information about the Economic Development of Frederick, click here. Premiere Dental Arts of Frederick is proud to be a leading dental practice in the great city of Frederick. We are always welcoming of new patients of all ages. Click here to learn more about Premiere Dental Arts of Frederick.